TCF’s roots come from two couples around a kitchen table in Coventry, England in 1968. Today, there are more than 600 chapters in all 50 states plus Washington, DC and Puerto Rico. 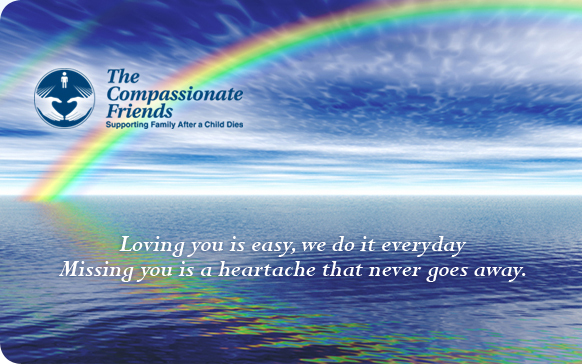 The Compassionate Friends is a nonprofit, self-help support or-ganization composed of bereaved parents, adult siblings and grandparents. We offer friendship, understanding, and hope to anyone who has experienced the death of a child of any age, from any cause. Our meetings give those attending an opportunity to talk about the child who died and about the feelings experienced while go-ing through the natural grief process. The Compassionate Friends is a non-religious organization and has no membership dues. The purpose of this support group is not to focus on the cause of death or the age of the child when he or she died, but to focus, instead, on the natural grieving process and the feelings and issues that surround the death of a child and what follows. everyone who finds us will be helped. We need not walk alone. We are The Compassionate Friends. We reach out to each other with love, with understanding and with hope. The children we mourn have died at all ages and from many dif-ferent causes, but our love for them unites us. Your pain be-comes my pain, just as your hope becomes my hope. We come together from all walks of life, from many different cir-cumstances. We are a unique family because we represent many races, creeds, and relationships. We are young and we are old. Some of us are far along in our grief, but others still feel a grief so fresh and so intensely paingful that they feel helpless and see no hope. Some of us have found our faith to be a source of strength, while some of are struggling to find answers. Some of us are an-gry, filled with guilt or in deep depression, while others radiate an inner peace. But whatever pain we bring to this gathering of The Compassionate Friends, it is pain we will share, just as we share with each other our love for the children who have died. We are all seeking and struggling to build a future for ourselves, but we are committed to building a future together. We reach out to each other in love to share the pain as well as the joy, share the anger as well as the peace, share the faith as well as the doubts, and help each other to grieve as well as to grow. We Need Not Alone. We Are The Compassionate Friends. We are the surviving siblings of The compassionate Friends. We are brought together by the deaths of our brothers and sisters. Open your hearts to us, but have patience with us. Sometimes we will need the support of our friends. At other times we need our families to be there. Sometimes we must walk alone, taking our memories with us, continuing to become the individuals we want to be. We cannot be our dead brother or sister; however, a special part of them lives on with us. When our brothers and sisters died, our lives changed. We are living a life very different from what we envisioned, and we feel the responsibility to be strong even when we feel weak. Yet we can go on because we understand better than many oth-ers the value of family and the precious gift of life. Our goal is not to be the forgotten mourners that we sometimes are, but to walk together to face our tomorrows as surviving sib-lings of The Compassionate Friends. Since the early centuries, the butterfly has symbolized renewed life. The caterpillar signifies life here on earth; the cocoon, death; and the butterfly, the emergence of the dead into a new, beautiful and freer existence. Frequently, the butterfly is seen with the word “Nika”, which means victory. Elisabeth Kubler-Ross movingly tells of seeing butterflies drawn all over the walls of the children’s dormitories in the World War II concentration camps. Since Elisabeth believes in the innate intui-tiveness of children, she concludes that these children knew their fate and were leaving us a message. Many members of The Compassionate Friends embrace the but-terfly as a symbol—a sign of hope to them that their children are living in another dimension with greater beauty and freedom...a comforting thought to many.